Check out who was mentioned in this PCWorld article. 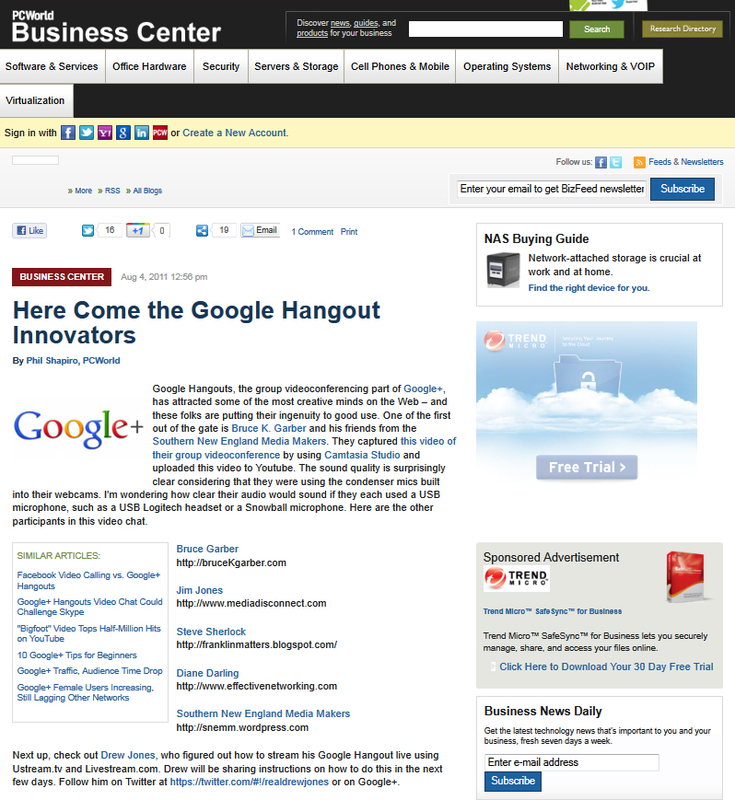 Google Hangouts, the group videoconferencing part of Google+, has attracted some of the most creative minds on the Web – and these folks are putting their ingenuity to good use. One of the first out of the gate is Bruce K. Garber and his friends from the Southern New England Media Makers. They captured this video of their group videoconference by using Camtasia Studio and uploaded this video to Youtube. The sound quality is surprisingly clear considering that they were using the condenser mics built into their webcams. I’m wondering how clear their audio would sound if they each used a USB microphone, such as a USB Logitech headset or a Snowball microphone. Here are the other participants in this video chat. Next up, check out Drew Jones, who figured out how to stream his Google Hangout live using Ustream.tv and Livestream.com. Drew will be sharing instructions on how to do this in the next few days. Follow him on Twitter at https://twitter.com/#!/realdrewjones or on Google+. Wherever opportunities for ingenuity exist, Phillip Torrone, senior editor at MAKE Magazine, is not far behind. Check out the Ask an Engineer – Show and Tell Hangout he recently ran. Yes, a little rough around the edges, but ripe with opportunities for sharing ideas at the most grassroots of levels. Folks, if you’re still watching television, you’ve never left the last century. Put down that remote and pick up your imagination. The imagination train will be leaving the station and it’s best if you were on board. Instead of doing the “channel surf,”you could be establishing your own creative turf. Think carefully about the new world that is a-borning – and your role in it. Are you a leader or are you a follower? What rewards – emotional, social, financial — lie waiting for leaders? What experiences are typically encountered by followers? What ways are there to minimize risk and still be a leader? What collective ways are there to minimize risk and still pursue innovation? What is the price of indecision? What is the cost of delay? Grateful thanks to Steve Garfield, founder of Boston Media Makers and author of the very useful videoblogging guidebook Get Seen. I met Bruce K. Garber when I virtually attended a Boston Media Makers meeting. Follow Steve Garfield on Twitter (or Google+) to stay in the loop about all media making opportunities and innovations.